The visual testimony of the CCTV footage is the most objective evidence available of the treatment of Ms Dhu while she was in custody. It exposes the physical violence perpetrated through actions such as dragging, flinging, shoving and other forms of manhandling of her visibly ill and wounded body. The footage was played several times throughout the inquest and Ms Dhu’s family initially opposed its release to the media. Upon the conclusion of the inquest, they reconsidered their position and decided that was in the public interest to release the CCTV and a way of honouring Ms Dhu’s memory. Despite the position of Ms Dhu’s family, the Coroner ruled against releasing the footage on the paternalistic grounds that it had the potential to re-traumatise them. In response, Ms Dhu’s Uncle Shaun Harris led a tireless campaign to release the CCTV footage. This was supported by the First Nations Deaths in Custody Watch Committee. Applications for the release of the CCTV footage were heard on 28 September 2016 – the 33rd Anniversary of John Pat’s death in police custody. 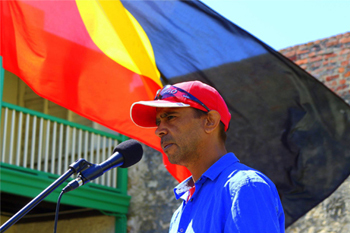 Shaun Harris speaking at John Pat Day Memorial, Fremantle Prison, 2016. Photo: Charandev Singh. There was no apparent awareness, acknowledgement or consideration of scheduling this hearing on a date so significant to Aboriginal communities, particularly in WA. The violence that killed John Pat and the violence that killed Ms Dhu are not dissimilar, one thing that separates them aside from three decades is the how their deaths were documented.